We have worked with several companies in the emerging commercial electric vehicle industry. NATC understands and is knowledgeable about the configurations and requirements and can help develop a test plan for evaluations. Transportability features of a component are inherent to the system as a whole and should be evaluated and scrutinized as these features may dictate the safe and efficient movement of the article. NATC offers comprehensive winter testing solutions, along with complete facility and security support to meet individual customer needs. The winter test facility offers optimal winter test conditions from December through March each year. NATC rigorously tests the electronic and electrical systems that are essential to the safe and proper operation of every new vehicle that rolls off the production line. These systems constantly increase in complexity, and we are committed to making sure that every unforeseen circumstance and behavioral anomaly is accounted for when proving that electronic systems will operate correctly. NATC's trained, experienced staff conduct tests for commercial and military vehicles in accordance with regulatory and industry standards. We provide guidance to our customers for navigating various standards and, in some cases, develop specific tests to cover multiple standards in a single test to reduce the overall number of testing cycles required. NATC performs Human Factors Engineering (HFE) evaluations for the 5th percentile female through the 95th percentile male, on vehicle platforms varying from passenger cars to 40-ton tracked vehicles. NATC offers numerous environmental test facilities for evaluating operability and material properties of vehicles, subsystems, and components in extreme environments. We have environmental and climatic chambers and years of experience performing standard and customized environmental testing. NATC engages with our military customers and industry to develop, integrate, and evaluate advanced survivability and lethality technologies that address current and future threats. We conduct independent, standardized testing of survivability and lethality solutions, referencing relevant protocols, and we assist our customers in developing their own test regimes to assess and refine their products. NATC is a leader in developmental and production tire testing for use on commercial and military vehicle platforms with a dedicated tire test department. From motorcycles to passenger cars to trucks to earthmovers and agricultural equipment, we use and develop test methods to evaluate and optimize tire performance over a broad range of on- and off-road conditions including mud, sand, snow, and ice. NATC is at the forefront of full vehicle performance testing for both commercial and military vehicle platforms, from small utility vehicles up to modern military tanks. Our available test bed for performance evaluations includes braking, acceleration, maximum speed, steady state stability, and dynamic steering and handling on both on- and off-road surfaces. NATC’s proving ground is situated in the Great Basin offering access to a wide variety of the terrain types found around the world, enabling us to accurately replicate mobility features and challenges found in various real-world environments. Today, electric drives are used in vehicles to increase fuel economy, reduce environmentally harmful emissions, provide lower life cycle costs, and more. NATC has been working with hybrid electric and electric vehicles since 1996, and we have designed and built mild, parallel, and series hybrid vehicles. We are well versed at evaluating and testing hybrid vehicle performance. Durability, end-limit performance, cooling, electrical performance, and EMI/EMC are all evaluations inherent to the capabilities that NATC encompasses. Our work with the U.S. Military includes creating specialized test plans and conducting tests and evaluations of a number of different hybrid platforms, from a Hybrid Electric M1037 HMMWV to a Heavy Expanded Mobility Tactical Truck (HEMTT) with a ProPulse® hybrid electric drive (HED) system. 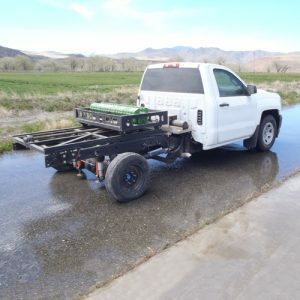 In addition, we designed and built a 6×6 hybrid electric platform (HEP), which used a 100 kW diesel engine and generator with independent drive motors at each of its six wheels. Power for electric operation was stored in a battery pack. The HEP drive motors allowed for steering through differential speeds from side to side, creating a skid steer effect that made the vehicle very maneuverable in tight spaces. We also have worked with several companies in the emerging commercial electric vehicle industry. NATC understands and is knowledgeable about the configurations and requirements and can help develop a test plan for evaluations. Furthermore, we can assist in modifying systems design to meet these standards. Contact us today to discuss how NATC can assist you. NATC excels at developing and executing myriad transportability evaluations. We expose test article systems and their integral transport provisions to real-world static and dynamic loads, often simulating worst-case loads the test article is expected to experience throughout its operational life cycle. Transportability features of a component are inherent to the system as a whole and should be evaluated and scrutinized as these features may dictate the safe and efficient movement of the article. Forces experienced during transport are not limited to longitudinal, lateral, and vertical directions or to tiedown and lifting provisions and their surrounding structure. Forces affect the test article as a whole in the form of shock and vibration, which are often experienced during rail transport. We have a fully functional rail impact facility consisting of a flatcar, yard locomotive and three buffer cars. We record impact speeds and parameters such as acceleration, strain, and displacement, among others. NATC conducts road, rail, ship or transportability evaluations in accordance with guidance provided within ASTM E1925, MIL-STD-209, MIL-STD-810, MIL-STD-913, TEA Pamphlet 55-19, and the Association of American Railroads. In cooperation with the Nevada Air National Guard out of Reno, Nevada and the Nevada Army National Guard out of Stead, Nevada, we perform “Roll-on Roll-off” evaluations where a test article is driven onto and off of either a C-130 military transport aircraft or a Chinook CH-47 tandem rotor aircraft. This enables inspection of the test article for any potential issues such as tight clearances that may inhibit its ability to be transported within that particular aircraft. Vehicles and most other material that require some form of transit to their final destinations may be exposed to whole system shock events as a result of being dropped at some point along their journey. Therefore, we conduct various “shock” or “transit drop” tests ranging from heights of 6 inches up to 18 inches off the ground, depending on customer requirements. NATC’s Winter Test Facility is a premier winter proving ground located in West Yellowstone, Montana. Available from November 15 to April 15 each year, our winter facility offers optimal winter test conditions from December through March, with approximately two million square feet of groomed test surfaces, expanded facilities and infrastructure. 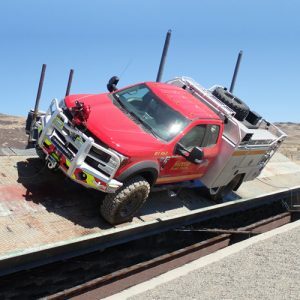 NATC performs a variety of Situational Awareness (SA) evaluations to assess the ability of the vehicle occupants to acquire knowledge of the immediate environment, whether internal or external to the vehicle. Generally, these evaluations consider three factors: the observer’s viewpoint, the observer’s ability to gather useful information, and the observer’s ability to correctly interpret the information gathered. Our SA tests and evaluations involve multiple vehicle subsystems including direct vision (windows, hatches, view blocks), indirect vision (cameras, displays), embedded sensors, communications (intercom, microphones), and collateral vehicle information (traffic), which may be measured independently or evaluated as an aggregate system. We offer complete SA systems design engineering to address issues such as visual acuity, detection distance, threat recognition, speed over a terrain segment, motion sickness, image stability, vision system parameters including resolution, update rate, latency and field of view. Since the early 2000s, we have designed hardware, software, and methods to measure visual system performance including object recognition, terrain estimation performance of a standard multi-camera situational awareness system, traversal performance of manned and unmanned vehicles across terrain, vehicle operator and commander performance, and target recognition and time on target. Additionally, we have worked with the VICTORY community to develop more robust information assurance techniques suitable for a DOD environment. NATC rigorously tests the electronic and electrical systems that are essential to the safe and proper operation of every new vehicle that rolls off the production line. These systems constantly increase in complexity, and we are committed to making sure that every unforeseen circumstance and behavioral anomaly is accounted for when proving that electronic systems will operate correctly. Our veteran team and purpose-built test equipment can test for many issues that may not be witnessed during normal production or shakedown testing operations. We work closely with our customers to determine the expected functionality of a product or system. Gaining a thorough understanding of a system is necessary for proper evaluation. Our team builds customized benches, chambers, or on-vehicle evaluation setups in a benign environment, simulating real-world operations with great fidelity. Monitoring the bench tests gives us a complete, end-to-end picture of the system, which we then stress via noise, part failure, power cycling, environmental exceedances, etc. We closely examine all available signals to see where failures occur and what events cause them. After identifying points of failure, our team determines a customized solution to address them. Whether our customers need a simple load test on an alternator, EMI testing on a prototype, a bench mockup with a custom graphical user interface for ease of use, or any other requirement, our skilled team of electronics and software engineers and technicians can develop the right solution. NATC’s trained, experienced staff conduct tests for commercial and military vehicles in accordance with regulatory and industry standards. Some of the standardization bodies include NHTSA, FMCSA, SAE, US DoD, DoE, Transport Canada, ISO, NATO and UNECE. We provide guidance to our customers for navigating various standards and, in some cases, develop specific tests to cover multiple standards in a single test to reduce the overall number of testing cycles required. We perform standardized tests precisely in accordance with the test plans developed by government or commercial entities. Additionally, we consult the government or commercial entity regarding any ambiguity or special circumstances not covered under the test plans to ensure that the test results we provide can be used to satisfy the self-certification process for any vehicle tested at NATC. Vehicles exempt from certain regulations may still be tested in accordance with the applicable portions of the regulations. Further, we provide homologation assistance for vehicle sales in North American markets to determine which requirements need to be met for a specific vehicle type. Standardized tests we conduct include, but are not limited to, the following. View our complete Standardized Test List. Read more about our standardized Transportability, Tire Testing and Winter Testing. NATC conducts brake tests on vehicles ranging from motorcycles to class 8 trucks, with the objective of these tests ranging from developmental testing to compliance testing for government agencies such as NHTSA. We perform brake tests to FMVSS, EC/ECE, ISO, SAE, ASTM, California Title 21, or other specifications as defined by our customers. We also offer specific, customized, brake tests for vehicle development, accident reconstruction/investigation, corrosion, and other customer needs. 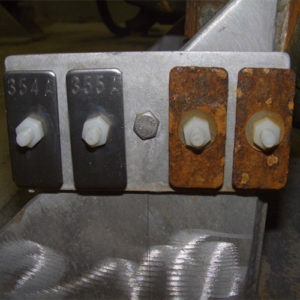 Brake testing that is not in accordance with a government standard may use the same instrumentation and/or portions of the procedures as a baseline. Additional instrumentation may include steering response, position transducers, or additional pressure or temperatures sensors. If a customer has specific areas of concern, we develop a test plan to target those characteristics, such as braking during a variety of long mountain descents. Designed and built in-house by NATC engineering and fabrication personnel, the tilt table augments NATC’s vehicle dynamics testing capabilities. These capabilities include, but are not limited to, handling, roll stability quantification, end limit performance, side slope operation, fork lift capability, active suspension development, and a multitude of standardized tests in accordance with regulatory and industry standards. We conduct evaluations to determine the static lateral stability and rollover thresholds of the test article as well as roll characteristics based on chassis stiffness, and to estimate lateral acceleration. Testing may include vehicle component operation such as boom or water cannon operation. The same types of tests can be conducted on non-vehicular products such as shelters, skid-mounted assemblies, and containerized assemblies and systems. Equipped with a high friction surface to inhibit sliding of the test vehicle, the tilt table rotates at a rate of approximately 0.09 degrees per second to determine the static roll properties of the vehicle and to prevent abrupt roll input into the test vehicle. With a surface area of more than 8,000 square feet and a lifting capacity of approximately 350,000 pounds, the tilt table can be used for many types and sizes of vehicles up to and including buses, tractor-trailer rigs, crash-fire rescue apparatus, ambulances, and heavy equipment used in construction, material handling, mining, and agriculture. NATC performs Human Factors Engineering (HFE) evaluations for the fifth percentile female through the 95 percentile male, on vehicle platforms varying from passenger cars to 40-ton tracked vehicles. Our HFE assessments include, but are not limited to, occupant field of view, body position while seated, ingress, egress, lever position, pedal angle, pedal application force, step height, handholds, and internal and external noise levels. We provide our customers with measured data, thorough subjective feedback on the assessed items, as well as photography and videography documentation of the actions performed. We use numerous standards to conduct HFE testing, such as TOP 1-2-610 Human Factors Engineering, SAE J985 Vision Factors Considerations in Rearview Mirror Design and MIL-STD-1472 Human Engineering. Other evaluations we conduct include door and hatch operations on grades and side slopes, optimization of operator control and instrumentation arrangement, and seat belt/restraint function and compliance. Whenever our customers require it, we are ready to tailor the evaluations to satisfy a customer’s end goal for these and numerous other HFE evaluations. NATC develops user evaluations based on our extensive experience as vehicle operators, training instructors, and test engineers. The evaluations provide an all-encompassing curriculum that prepares users not only for driving the vehicles, but also for understanding the vehicle-to-terrain interface and how to apply that understanding to performance specifications or requirements. Our standard user evaluation courses typically last from one-to-10 days. The courses range from basic driver and trail experiences up to long-range vehicle movements in combination with up-front operator training such as ROHVA UTV classes, tire-blowout training, obstacle avoidance, terrain recognition, off-road driving, rock crawling and high-speed training. We have a highly skilled staff of engineers and mechanics to keep the vehicles in top working order. Our user evaluation training provides a comprehensive evaluation atmosphere that is dedicated to improving the vehicle program overall by enhancing understanding of the interaction between driver, vehicle system, and terrain. We have the advantage of a vast test facility with access to over 6,200 acres of proving grounds, 735 acres of snow and ice covered terrain in West Yellowstone, MT, and local access to Sand Mountain Recreation Area, a two-mile-long sand dune. With these facilities, we have the ability to replicate most any terrain required for a well-rounded and complete user evaluation program. Whether our customers desire high-performance/high-speed operation or virgin snow and ice covered roads, we can tailor the evaluation to appropriate needs and objectives. User evaluation group sizes have ranged from four to 40 operators in a single evaluation. NATC offers numerous environmental test facilities for evaluating operability and material properties of vehicles, subsystems and components in extreme environments. We have environmental and climatic chambers and years of experience performing standard and customized environmental testing. Our chambers are capable of running 24/7 and can achieve cyclic and non-cyclic temperature extremes of -60 °F up to 160 °F (-51 °C to 71 °C) while maintaining a breathable air environment for performing operation checks at temperature. The chambers are reconfigurable and expandable, capable of fitting test articles ranging from small components to oversized vehicles as long as 85 feet. We set up the chambers to create simulated environments and climates with humidity, solar radiation (simulated sunshine), salt fog, dust, rain, ice and snow, as required. We use our wind machine when establishing simulated environments and climates for performing blowing rain, blowing sand and blowing dust evaluations. Furthermore, we configure the chambers to integrate with durability and reliability tests to ensure full vehicle system exposure. Other environmental and climatic testing capabilities include, but are not limited to, the following. Commercial testing of air conditioning systems, defrosting/ defogging systems, engine cold and hot starting, tire aging and extreme temperature characterization, vehicle full and road load cooling, and vehicle paint and rust protection coatings can be performed. Sensors and data acquisition equipment are available to measure and record virtually any quantity, frequency and type of test parameter of interest, including (but not limited to) engine, wheel and fan speeds; manifold, coolant and hydraulic line pressures; vehicle component, reservoir, exhaust and surface temperatures; exhaust gas emissions; and fuel, air, lubricant and coolant flow rates. Dedicated data acquisition systems allow up to 250 channels of simultaneous data collection and analysis of both digital and analog signals. NATC designs instrumentation applications to meet customer needs and all necessary instrumentation is available on site, allowing for efficient, “one-stop” testing. NATC is an industry leader in full-vehicle and component-level accelerated corrosion testing. We use standards created by OEMs, the Department of Defense (DoD) in conjunction with the Office of Naval Research (ONR), and internally developed procedures. We perform accelerated corrosion testing to determine a product’s resistance to corrosion for aesthetics, reliability, reduction of warranty claims and overall life cycle cost. Our corrosion facilities include the environmental chambers, a walk-in sized environmental chamber, various salt spray application devices, and water fording facilities ranging from shallow high-speed splash to deep water. The dedicated corrosion chamber has a pH meter embedded in the salt solution supply line for monitoring and recording pH of the salt solution during each salt fog application. Our specialized vibration courses include Belgian Block, chatter bumps, potholes, washboard, and more. Our full-service accelerated corrosion development programs enable us to identify less than desirable corrosion characteristics prior to releasing an item to market. Corrosion is one of the more critical and influential variables that contributes to a vehicle’s overall life cycle cost and durability, and we understand the detrimental effects it may have on a vehicle system. When performing durability corrosion testing, we evaluate a test article’s duty cycle and focus on the elements that have the greatest effect on corrosion characteristics. To evaluate those effects, we conduct many corrosion/durability evaluations where discrete over-the-road type corrosion elements are introduced to the test article within its mission profile mileage accumulation. We ensure repeatable results by using standardized coupons during testing to monitor corrosion rate and mass loss. NATC engages with our military customers and industry to develop, integrate, and evaluate advanced survivability and lethality technologies. We conduct independent, standardized testing of survivability and lethality solutions, referencing relevant protocols including TOP, ITOP, AEP, ASTM, STANAG, and SAE standards. In addition to assisting our customers in developing their own test regimes to assess and refine their products, we produce timely results to provide fieldable solutions that address current and future threats. Since 1969, NATC has been testing a wide range of small to intermediate caliber munitions and delivery systems from small arms through 122mm and TOW missiles. As mine blast and kinetic energy threats became prevalent events in theater, NATC contributed to advancements in testing procedures within the testing community to evaluate these threats. We continue to build on our significant experience with system and subsystem blast mitigation, lightweighting solutions, active protection technology, armor enhancement, and weapon system development to better serve and protect the war fighter. NATC’s development and test engineers are agile in designing, integrating and evaluating a range of design and material options for your application, including a variety of armor grade steel, aluminum alloys, advanced lightweight materials, armor arrays and kit solutions. We evaluate both active and passive armor protection against most major direct and indirect fire weapons, as well as fragmentation grenades and fire bombs. We analyze armor protection against unconventional hostile threats and actions. Our design engineers build these solutions in CAD and produce developmental and production level drawings and technical data packages to inform manufacturing processes for system solutions. NATC performs a variety of engineering and testing services to address survivability and lethality, including the following applications and tools. Armor panel test fixture with obliquity control up to 60 degrees, panel size up to 48″x 48″x 5″ thick. This fixture can be modified as required for specific test requirements. NATC’s indoor ballistic test range utilizes fixed powder breech weapon stations with interchangeable barrels capable of firing a variety of calibers and projectiles from 5.56 mm to 30 mm, including 20 mm FSP above 5,000 fps. A proof chronograph velocity measurement system is installed for measuring and recording projectiles velocities. An adjustable target holder can accommodate test panels up to 48″ x 48″ and allows for ease of adjustment in the vertical, lateral and angular directions. This entire test range setup is housed in fixed steel structures to provide security and protection from the elements. The weapons are triggers remotely from the safety of a nearby range control room, which also houses the chronograph control and display computer. An adjacent reloading room allows propellant charges to be prepared immediately for each shot to obtain the desired impact velocity. All tests generally follow the operating procedures specified in AEP-55 Vol.1 and TOP 2-2-710, but detailed test procedures are established for each test based on the specific objectives of the project. NATC is a leader in developmental and production tire testing for use on commercial and military vehicle platforms with a dedicated tire test department. From motorcycles to passenger cars to trucks to earthmovers and agricultural equipment, we use and develop test methods to evaluate and optimize tire performance over a broad range of on- and off-road conditions including mud, sand, snow and ice. We have qualified personnel with years of experience and expertise in tire testing. We test to national and international standards including ASTM F1805, SAE J2014, and qualifying for the Cooperative Approved Tire List per ASTM F1922. We can tailor tests to provide unique customer solutions in a timely and effective manner. Our tire test department is equipped with a multitude of instruments, vehicles, and tools with access to over 3,000 miles of defined test courses representing over 85% of the world’s terrain, and we can test 24 hours per day and 365 days per year. Our Dynamic Force Measurement Vehicles (DFMVs) allow us to evaluate single wheel driving, braking and turning traction for passenger car through heavy truck tires. We are an approved facility under the Cooperative Tire Qualification Program (CTQP) capable of evaluating tires for the Cooperative Approved Tire List (CATL) per ASTM F1922 for passenger car, light truck, truck/bus, and off-road severe application (ORSA) tires. We offer destructive and non-destructive tire inspections and failure analysis. Our tire X-ray and measurement equipment enable us to efficiently identify tire wear/failure mechanisms and pinpoint contributing factors resulting in timely, accurate solutions. No matter the end user, commercial or military, NATC is committed to helping our customers manufacture reliable and functional vehicles. Our durability evaluations are all-encompassing tests that supplement the development of vehicles and other test articles. From commercial passenger vehicles to tactical wheeled military machines, durability testing is a crucial element in the developmental phases for whole vehicle systems, from component level to complete vehicle. We develop and facilitate durability and accelerated durability tests to expose vehicles to real-world dynamic inputs representative of their expected operating environments and duty cycles. We work closely with our customers to develop and complete standard and accelerated durability evaluations with the intent to acquire and analyze pertinent test data. The results of the analysis contributes to the understanding of test article durability when exposed to mission profiles or operating environments while meeting our customer’s time constraints. Cyclic road load forces introduced to test articles through their suspensions, and ultimately through the entire test article system during durability evaluations, often initiate internal wear. This causes fatigue failures that require analysis and potential mitigation through test article design modifications. We achieve dynamic loads by traversing numerous test courses at our proving grounds, ranging from primary high-quality pavement to severe off-road, cross-country terrain. These test courses create a mixed terrain durability route predetermined for the test articles or developed by us with the customer. The route closely represents the anticipated operating environment the vehicle will encounter. 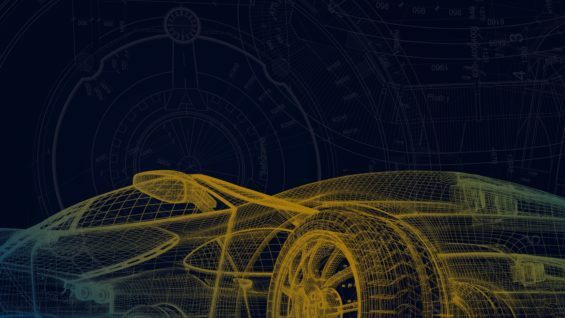 Drawing from decades of durability testing experience, our durability evaluations enable our customers to gather valuable, real-world data and knowledge that ultimately enhance test article development and provide high-quality end products. Reliability, availability, maintainability, and durability (RAM-D) testing offers more in-depth durability measurements of reliability characteristics, reliability point estimates, and maintenance intervals. NATC can design and support accelerated durability evaluations with expedited dynamic load exposure, within reasonable mileage accumulations, in the test article’s operating environment. While field tests generally are harder to control than laboratory tests, we believe they offer a greater degree of realism since the vehicle is fully operational during the test, exactly as it will be in service. NATC does field testing only at our facility. NATC is skilled in developing durability routes that simulate rough on- and off-road environments often experienced by people with an active outdoor lifestyle. Whether your customers are heading to the slopes, transporting to water’s edge, or discovering new trails to explore, getting off the beaten path is often essential. To get the snowboard, boat or bike to the destination in one piece, users demand sturdy and secure equipment that can hold up to rugged terrain. We offer a full range of tests for accessory equipment over various routes to ensure that it is up to the task. Our test engineers have access to over 3,000 miles of test courses and can tailor testing from roof and ladder racks to winches and off-road jacks to meet your needs. Our range of comprehensive testing capabilities can target specific characteristics, performance and support industry standards. NATC is at the forefront of full vehicle performance testing for both commercial and military vehicle platforms. We evaluate vehicles ranging from small utility vehicles up to modern military tanks, and we have a deep knowledge of historical vehicle capabilities and of current and future trends in vehicle capabilities. Our typical performance evaluations include braking, acceleration, maximum speed, steady state stability, and dynamic steering and handling on both on- and off-road surfaces. We also often help customers develop specific performance tests and criteria for their particular product. Our performance testing department offers numerous instrumentation assets, vehicles, and shop facilities to support performance testing on any of our wide range of test courses. We evaluate all aspects of ground vehicle operations and performance on site, and conduct a comprehensive array of standard automotive certification and performance tests in accordance with FMVSS, CMVSS, ISO, SAE, DOT, ASTM, NAV-SEA, FMCSR, EEC/ECE and military standards. In addition, we have the expertise and flexibility to design tests to meet our customers’ specialized testing needs. Our test engineers are hands-on, have years of experience evaluating vehicle systems, and characterize a vehicle’s performance using innovative approaches while referencing historical lessons learned as guidance. Through this range of real-world testing capabilities on our vast facilities, we can provide analytical results to improve a vehicle’s handling, acceleration, and braking characteristics. Our performance testing facilities include numerous skid pads with varying surface coefficients. Primary test surfaces, prepared in accordance with AASHTO and ASTM specifications, include provisions for either controlled wet or dry use and range from wet smooth concrete (SN 25 +5 wet) to dry asphalt for braking tests (SN 85 +5). We use these facilities for vehicle dynamics testing and for ABS and traction control system evaluations. We also conduct performance testing on a 200-foot constant-radius paved circle for steady state stability evaluations and a section of 12-foot-wide, 500-foot-radius curve for ABS brake system certification under California Title 21 and the revised FMVSS 121 requirements. Our 11-mile Standard Slag Road, built for gross vehicle weights up to 160 tons, is available for high-speed, dynamometer, braking, cooling and handling tests. NATC’s proving ground is situated in the Great Basin offering access to a wide variety of the terrain types found around the world, enabling us to accurately replicate mobility features and challenges found in various real-world environments. Our extensive range of test courses includes fine-grained and coarse-grained soft soil mobility courses, winter climate ice and snow courses, an array of obstacles and grades, amphibious test facilities, and various courses defined and maintained to DoD mission profiles and recreational mobility. We assess and evaluate commercial and military vehicles over a variety of mobility events and for capabilities that include, but are not limited to, the following. Read more about our facilities and courses.